Laverbread is a most versatile ingredient in modern cooking. The mineral savour complements freshest produce and eclectic ingredients, and its dramatic appearance can be used to great effect. A mere touch can transform a sauce as a beurre blanc or salsa, but it can be used generously in dishes as risotto, seafood gratin or a fish curry. Seaweed is used widely in Far Eastern cuisine, laver being by far the most popular as ‘nori’ used in sushi, sauces and as a flavour with meats and seafood. 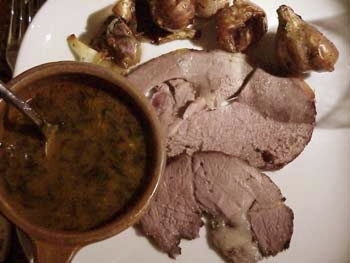 These recipes and serving suggestions give a taste of how laver can be used. With adaptations and new culinary ideas, this seaweed can bring excitement to a wide range of dishes. Heat oven to 150C, 350F, gas mk 4. Roll out pastry and line 1 large or 2 medium flan cases, or make 40 - 50 ‘mince pie’ size. Mix eggs, cheese, milk and laverbread in a bowl (or liquidiser) until well blended. Add leeks and herbs and mix in well. Season generously, then fill the flan cases three quarters full and bake in oven on a heated tray for 15 - 20 minutes, depending on thickness, until the mixture is set and the flan golden on top. Serve hot, warm or cold. This can be varied by adding other vegetables as artichokes, courgettes, sun dried tomato etc to expand the colours and flavours. 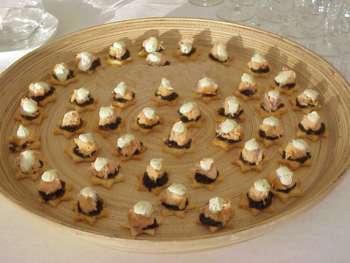 Diced cooked bacon or ham, strips of prosciutto or Carmarthen ham, diced smoked salmon, flaked cooked salmon, cod or other fresh or smoked fish are among many possible variations on the theme. Put all ingredients into a jar with a tight-fitting lid and shake to mix well. Will keep in the refrigerator for 2 days. Shake again before use. Can be served warm or cold. Heat pan or grillomat until smoking. Very lightly oil and brush fish with oil. Sear for 30 - 60 seconds, depending on thickness of fish, turn over, season lightly with sea salt and pepper, and cook for a further 30 seconds, then remove and put on a warm plate. Spoon or drizzle the salsa around or over the fish. The salsa may be pre-warmed in a pan if desired. Other fish as cod, bass, monkfish, swordfish, mackerel etc may be served in place of tuna. The salsa goes very well with rice dishes as a seafood pilaff, or a biryani. Pound the bread into crumbs in a food processor. Add the garlic and coriander (or parsley) and pound until chopped quite finely, giving the crumbs a green flecking. Add very cold butter in 4 - 6 pieces; quickly pound to chop into the crumbs. Remove and refrigerate, or use immediately. Season the laverbread then put a quarter into each gratin dish, spread out and top each with cockles. Cover with breadcrumb mix. Cook in oven for about 10 minutes until golden and crisp on top, or heat in microwave and brown under a hot grill. Instead of cockles try mussels, clams or scallops; fresh cod or haddock, sliced thinly on the laverbread; flaked smoked mackerel or tinned tuna. Grated cheese as Welsh cheddar can be added to the breadcrumbs for a richer dish. A traditional savoury cheese croquette, given a sea savour with laver. flour and golden breadcrumbs for coating. Heat the chicken stock, add the spring onions and the laver, and simmer for a minute. Stir well and add the eggs, and season, then drop in the crabmeat and mix well. Top with chopped coriander, drizzle with sesame oil and serve. 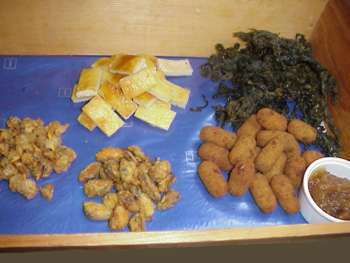 Other flaked fish may be added in place of crab, or other shellfish as prawns, cooked mussels and cockles. Rinse the scallops and pat dry, then slice each onto 2 or 3 pieces, keeping roes whole. Mix the mayonnaise with the chilli sauce, blending well, with the juice of one lime. Slice and lightly fry the mushrooms in a little oil, and put into scallop shells. Top with the scallop pieces, and put under grill for 1 - 2 minutes. Remover from grill and spread a small amount of anchovy on the scallops, then top with a small spoon of laver, then cover with the chilli mayonnaise, return under the grill and cook for a few minutes until the top is golden. Serve scallop shells on seaweed-covered plates if possible, or a salad garnish, with a quarter of lime on each. Mix the cream and goat’s cheese well to a smooth spreading mixture. Season with black pepper. Put one pancake onto a 25cm plate, and spread a quarter of the cream evenly over. Top with a quarter of the smoked salmon and spread with a little laverbread, then top with a little rocket. Put another pancake on top and repeat until four layers have been made. Refrigerate for 1 - 2 hours, then cut into wedges like a cake and serve with a dressed salad with some of the laverbread salsa as above. Any smoked fish or cooked flaked fish may be used in this dish. 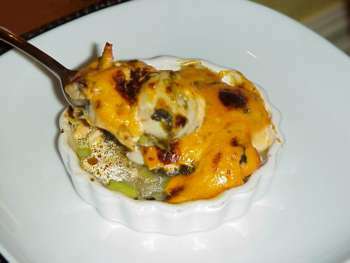 It can be dressed up with a topping of the cheese decorated with prawns. Heat a pan or grillomat until smoking. Lightly oil lamb and cook for 2 minutes without moving around. Turn over and season with sea salt and milled pepper, cook for 1 - 2 minutes, depending on thickness of steak and how well it is to be cooked. Remove and keep warm. Deglaze the pan with the wine, stirring in any caramelised bits. Add the stock and cook through well, reducing slightly. Add the orange juice and laver and heat well, swirling pan to mix sauce. Check seasoning and add the butter, swirling to emulsify. Pour onto heated plates and serve the steaks on the sauce, topped with a half teaspoon of laver. Cook the onions in oil until soft. Remove half and cook the rest until crisp and golden. Remove and keep warm. Return first onions to the pan and add garam massala and cook gently for 1 - 2 minutes, taking care not to burn. Add the lentils, then the vegetable stock, and cook until getting thicker. Add the tomato and laver and cook for twenty minutes, stirring occasionally. Test for seasoning, add the coriander, top with the golden onions and serve as a dish itself or to accompany a curry. 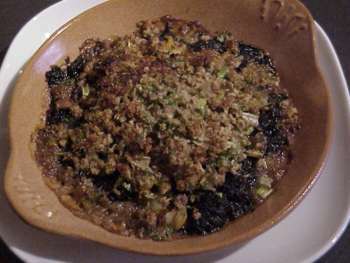 Laverbread is very good added to lamb, chicken or vegetable curries in place of spinach. 300g dry cured bacon fried cockles, sausages, black pudding, eggs, tomato, mushrooms as desired. Mix the laver and the oatmeal together, seasoning lightly. Using two dessertspoons form into egg shapes and flatten slightly. Cook the bacon in a pan and keep warm, then fry the laver and oatmeal cakes in the fat for a few minutes either side until just crisp. Serve with the bacon and other breakfast ingredients. Alternatively laver can just be heated in a pan and served as a vegetable purée with breakfast. Lightly beat the eggs, adding milk and seasoning. Heat a non-stick pan with the butter and before it colours add the egg. On a medium heat stir continually with a wooden spoon or spatula. Once it begins to thicken add the laver, continue mixing until it starts to set. Remove from heat and continue mixing thoroughly, adding the Tabasco and snipped chives. It should be a thick, flowing mixture. Spoon onto the hot, buttered toast and serve. This can be topped with smoked salmon, other smoked fish or shellfish, fresh prawns heated in a little butter, or other fresh fish or shellfish. Also top with prosciutto, Bayonne, Serrano or Carmarthen ham, thinly sliced. In a large pan fry the shallots in oil until just colouring. Add the rice and cook for a minute then add wine and cook until it evaporated. Add a quarter of the stock and cook, stirring frequently until the juices have almost evaporated. Add further stock a quarter at a time, until the rice is almost cooked (nearly 20 minutes), yet retaining a nutty texture. Season well and add the laver and the cream, mixing in well. Add the parsley and cheese and heat through. Cover with a cloth and leave for five minutes before serving. This will go well with fish and meat dishes. Or it can be served as a starter topped with some fresh shellfish as scallops, oysters, mussels, clams all very lightly cooked. Place 1 teaspoon of laverbread onto biscuits etc and top with prawns, taramasalata, houmous, smoked salmon, smoked mackerel Mini quiches - Proceed as for laverbread Pantysgawn quiche, but add in tossed cockles, bacon as a mini Welsh Breakfast, or vary with Welsh goats cheese. For delicious snacks add laverbread to: Welsh rarebit, mashed potato, a filling for jacket potatoes, or a topping for a pizza. Add a small quantity of laverbread with homemade or quality mayonnaise, organic yoghurt or crème fraiche and serve with goujons of fresh fish, fish cakes, vegetable crudités, potato croquettes or chips.